Over-clocking, Tweaking, and Optimizing, are just a few terms used by PC users whom TechwareLabs list as Extreme Gamers or those who are not just looking to get a standard system, but are the ones who are willing to tweak their systems and get every last drop of performance. For those select individuals ASUS has built a motherboard like nothing that has been released to date. The ASUS M4A79 Deluxe is an over-clocker’s dream when it comes to selecting processor, RAM, DRAM, North and South bridge voltages. Now, this may not surprise most of us who over-clock our systems, but how you select what the settings are is very suprising. The ASUS M4A79 deluxe allows you to manually enter the voltage for every line item listed so far and more using what they call “Step-less Frequency Selection.” Prior to this all the options included choosing predefined range of voltages and settings which was very limited and could only be adjusted in some cases by .25Volt or greater increments. Taking it a little further, we have those motherboards which only have an option for just “Optimize,” which is some predefined setting that was specified by the manufacturer with the processor, and video card of the month at the time the motherboard was just a prototype. Essentially Asus has taken us from a hole in the wall resturant with a 2 page menu to a full buffet with enough choices for even the pickiest of eaters. 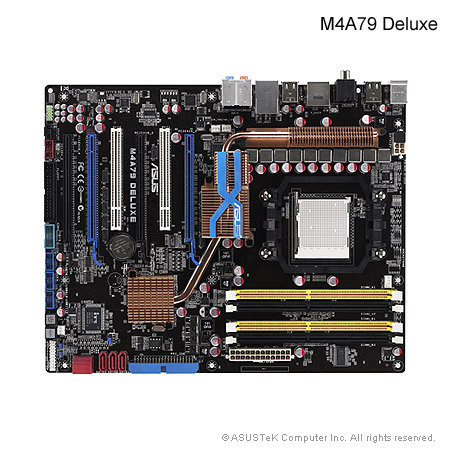 So, since I have your attention, let us take a good look at the ASUS M4A79 Deluxe. **Due to OS limitation, when installing total memory of 4GB capacity or more, Windows® 32-bit operation system may only recognize less than 3GB. Hence, a total installed memory of less than 3GB is recommended. What is important to note here is that the ASUS M4A79 deluxe looks to be designed and targeted towards both gamers and overclockers. Of course many gamers are overclockers seeking to squeeze out the most performance from their rig so this makes sense. Why do we think its targeted towards gamers and overclockers? Lets look at the features: 4 PCIe 2.0 slots, 12 USB 2.0 ports, 8 channel audio, and as you will see below the ram voltage has 36 different settings. Now this is of course in addition to a host of additional features which all lend themselves to gaming and overclocking. The ASUS M4A79 deluxe is an AMD chipset board using the latest AMD CPU’s which as you are certainly aware have ben shown to be amazing overclockers hitting 5 GHz and greater.